After you have logged in with your account, you can create your first character. 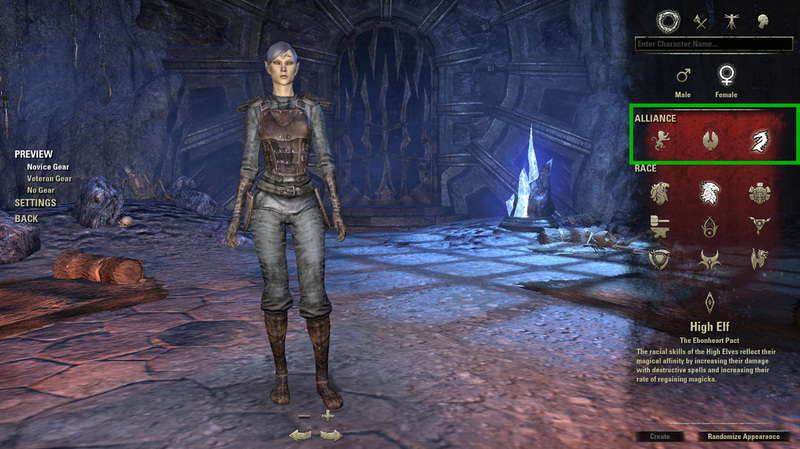 The first step in creating your character in Elder Scrolls Online is to name your character. The name you pick shows up on your friends list, Guilds roster and to other players. Your name does not have to be your account name starting with an "@" sign. Your name is basically your identity. Be creative with choosing your character name. Obviously you want your name to match your gender also. You can change your name in the input box stating: "Enter Character Name" in the top right of the character creation screen. As shown highlighted in the green box on the image below. Choosing your Alliance is very important, because it determines your spawn location and on which side you will be in the Alliance war. If you do not own the [Explorer's pack], your choice will also limit your choice in Races. You are now free to choose your Alliance. You can select an Alliance by clicking on the alliance icon under the word "Alliance". After picking your Alliance, it is time to pick a race. There is a total of 9 races you can pick from. Each race has unique passives which are bound to that race only. Picking your race also matches a role and class. Reading the description of each race already explains a lot on which role and class it performs best at. Now pick a race you like and will most likely fit your play style best. Your first character is to become familiar with the game. There is no wrong choice. 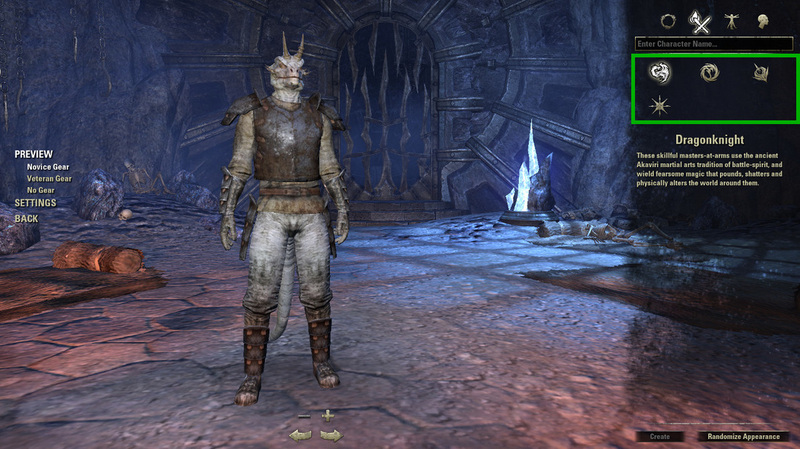 If you want a damage dealing Argonian or a Dark Elf as tank, go ahead. Picking the right class is very important. The best option is the one that fits your play style, role and also your race. Each class comes with a set of unique skills. These skills are devided into three class skill lines and all use magicka. 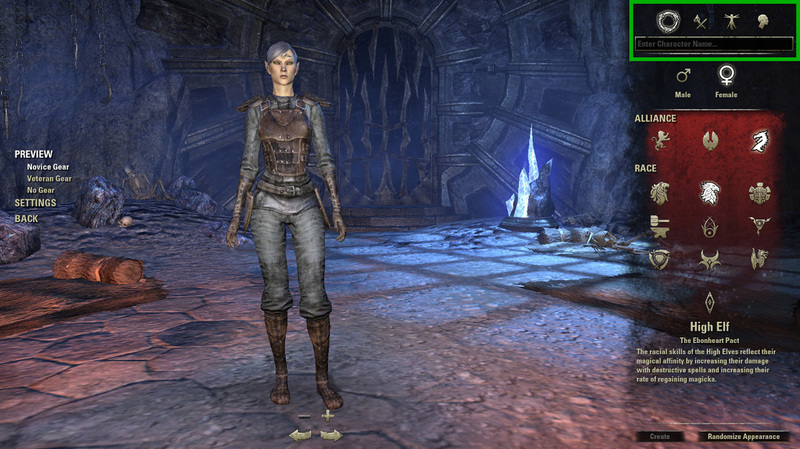 The nice part about Elder Scrolls Online, is that you can wield any weapon with any class. This means that you are not bound to wield a destruction staff if you pick Sorcerer. Agian, there is no wrong choice here. The list below will show the most common use of the classes. Feel free to pick the class you would like to play. As stated before, you are not bound to play one of the roles stated above combined with the class you pick. It will also help to read the description of each class stated in-game. The final step is changing appearance. Your appearance is how your character will look like during your Elder Scrolls Online experience. "Randomize Appearance" in the bottom right corner of your screen. Be creative and make your character look unique. Play with the sliders and finalise your character. You have now succesfully created your character. When you are pleased with the appearance of your character and the choices you have made, you can click on the "Create" button in the bottom right of the screen.